The Minister of State for Petroleum Resources, Dr Emmanuel Ibe Kachikwu, has said that the country’s oil production output in early 2019 is set to increase to about 2.2 million barrels per day, this includes 200,000 barrels per day from the Egina oil field. Dr Ibe Kachikwu, speaking earlier on Tuesday, acknowledged the delay in the planned renovation of the four (4) Nigerian National Petroleum Commission (NNPC) owned refineries in Port Harcourt, Warri, and Kaduna. Also, he expressed optimism that the Federal Government would take measures to revamp the four (4) refineries by the end of 2018, after which effective oil production activities will commence in early 2019. However, the Total’s Egina deep-water project is at the moment, the biggest oil and gas investment in Nigeria and is set to increase Nigeria’s crude oil production by over 10 per cent. The Minister, again said the Bonga Southwest and Zazaba projects were the two upstream investments that have the potentials to boost oil production. While he said foreign investment in Nigeria’s oil production industry has improved, he also stated that production could rise further from 200,000 to 400,000 barrels per day in few years time, if the required financial investment in the industry is done. The NNPC had earlier said it was in an ongoing discussion with prospective financiers, to carry out the renovations of the refineries, in order to increase local production and supply of petroleum products; as well as put an end to the importation of petroleum products. The Minister, furthermore, speaking on the oil market rebalancing efforts of the Organisation of Petroleum Exporting Countries (OPEC), ahead of their scheduled December meeting in Vienna, said he did not think OPEC and its allies would affect their current output strategy. “I do not think there is a need for any action unless we fully know the impact from Iran. I think there is too much of an alarm. My advice to OPEC is always to be careful of these alarms…I do not believe a big change will be taken at the next meeting” Dr Ibe Kachikwu said. 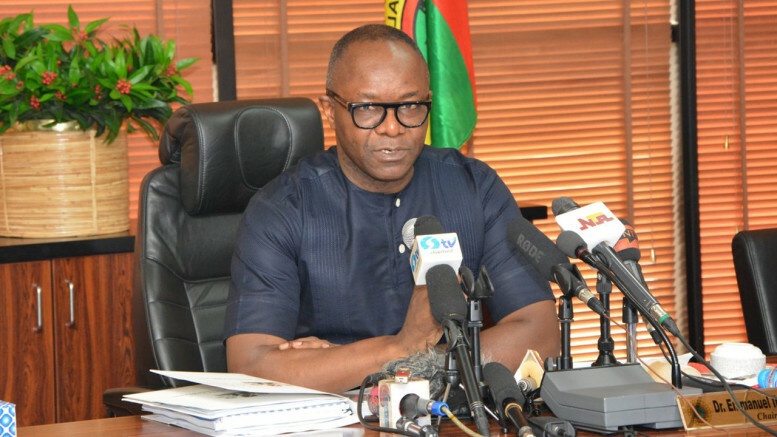 Be the first to comment on "Nigeria’s Oil Output To Hit 2.2mbpd In Early 2019 – Kachikwu"